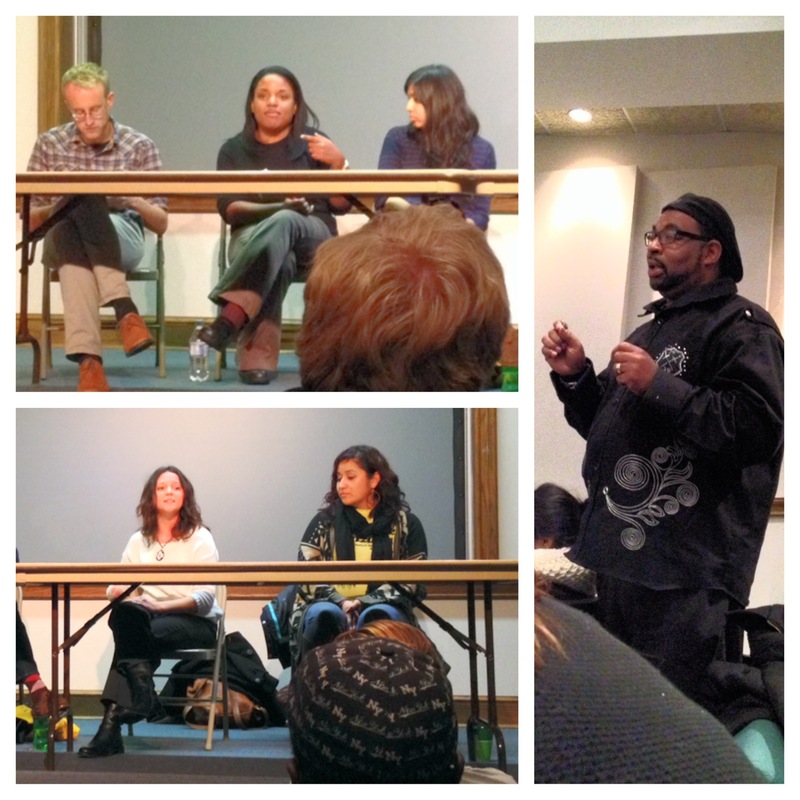 Panelists and community members discuss unfair sentencing, mass deportation, and prolonged solitary confinement at Rhodes College on December 5th. On a cold, rainy night in Memphis, a crowd of soggy yet determined concerned citizens brave the weather to gather for a talk on “Criminalization in the Age of Mass Incarceration,” hosted by Mid-South Peace & Justice at Rhodes College. The event features speakers from Chicago, Houston, Philadelphia, and Washington, DC, each speaking to a different issue in the criminal justice system: immigrant deportations, mandatory minimum sentencing, private prisons, solitary confinement. The news has just come in that Nelson Mandela has died. “Let’s take a moment to reflect on his legacy in the anti-apartheid struggle, as we look at the multiple human rights crises facing our country today.” Bob Libal with Grassroots Leadership opens the meeting with a moment of silence for the late South African leader. As the rain pelts the windows and audience members sniffle under their coats, the panel members bow their heads and pause, then introduce themselves. Nicole Porter is Director of Advocacy at The Sentencing Project, a national advocacy group calling for reforms in sentencing and alternatives to the prison industrial complex. She opens with some statistics, but seamlessly weaves in her own personal narrative. 2.2 million men and women in prison or jail, the highest rate of incarceration in the world, and over 5 million on probation or parole. “One in 10 African-American men are under some form of correctional supervision,” she begins. One of them is her twin brother. Arrested for a minor, nonviolent drug offense, “he was not going to be Tony Montana,” she says, referring to Al Pacino’s drug lord character in Scarface. Next up is Laura Markle Downton, Director of U.S. Prisons Policy at the National Religious Campaign Against Torture. Founded in 2006, NRCAT represents over 300 religious organizations committed to ending all forms of torture. As a white woman with access to education and privilege, she relates her first experiences helping former inmates find work as an “awakening,” and now focuses on solitary confinement, a form of torture where individuals are isolated in cement cells for up to 23 hours a day. Over 80,000 people are currently held in solitary, including youth and people with severe mental illness, with no due process or judicial review prior to the confinement, and no administrative hearings or internal review in the supermax prisons where the practice most often takes place. The way she tells it, immigration reform and enforcement used to be all about “residents versus nonresidents,” but that all changed in the late 90’s, when a raft of legislation stepped up militarization of the border, and the deportation regime went into overdrive after the Department of Homeland Security was established in the wake of 9/11. Today, “under President Obama, we’re about to reach 2 million deportations,” the highest rate of any presidential term in history. The administration recently upheld a 34,000 deportation bed quota, meaning “essentially, you have to find people to deport.” Shah notes that one of the most rapidly growing areas in the private prison industry is immigrant detention centers, and the first private correctional facility in the U.S. was an immigrant detention center opened by Corrections Corporation of America in Houston, TX, in 1984. In modern detention centers, detainees may be denied medical care, mistreated by guards, receive no notice of how long they’ll be detained, and never be allowed to speak with families or lawyers. In what Shah describes as “a complete lack of dignity across the board, ” inhumane conditions have driven some undocumented detainees to hunger strikes, or in some cases, suicide. In a bold respond to this indignity, Gabriela Marquez-Benitez with Latino Union of Chicago recently staged an act of civil disobedience at Broadview Processing Center in Illinois, chaining herself along with several others to the wheels of a detainee bus headed for the airport. While she works in Chicago now, “what I call my home is here in Memphis, here in the South,” she says. After the panelists’ presentations, the discussion turns to what the Memphis community is doing to organize resistance and solutions to these issues. As harsh mandatory sentencing, deportations, and inhumane detentions affect communities across the U.S., what is Memphis doing to advocate for its citizens’ rights? Many of the members in the audience were in attendance at a community meeting the night before, planning a public rally on police accountability under the banner of a broad grassroots coalition known as Memphis United. In a quiet coffee shop in Binghampton, activists discussed plans for the latest in a series of Know Your Rights workshops. They also discussed town hall meetings, a march, and hip-hop cypher in Downtown Memphis. All of this activity around justice reform is set to take place Tuesday, December 17th. The planned day of action would raise awareness of the issues of harassment and lack of due process facing people experiencing homelessness, those with criminal records and people facing deportation in the Memphis community. With participation from MSPJC, Homeless Organizing for Power & Equality, Tennessee Immigrant and Refugee Rights Network, and several other grassroots groups, the December 17th day of action promises to bring Memphis into the fold of a larger national movement for criminal justice reform. You can learn more and get involved with the ongoing efforts to organize criminal justice reform in Memphis at the website of Mid-South Peace & Justice.